Charles Postlewate began studying the guitar at age 12 with Lloyd Hazelbaker but received his first college education as a cooperative engineering student for Buick Motor Division at General Motors Institute (now Kettering University) in Flint, Michigan. During his final years of engineering studies at GMI, he studied jazz with Bob Brown and played electric guitar in jazz bands in the Flint and Detroit areas. He graduated with a Bachelor of Mechanical Engineering degree in 1964 and continued to work for Buick for two more years to save up enough money to study music at Wayne State University in Detroit. He was a theory/composition major who switched to classical guitar performance and received the first Bachelor and Master of Music degrees (1969 and 1973) in guitar performance in the school�s history, studying with Joseph Fava. His further studies on classical guitar include masterclass performances for Michael Lorimer and Oscar Ghiglia. As part of his graduate studies at WSU, Postlewate developed and taught classes in ensemble, literature, pedagogy, harmony and improvisation for the guitar. He has performed solo, chamber music, and concertos with orchestra in concerts across the United States, Canada, Mexico, Peru and the Caribbean. 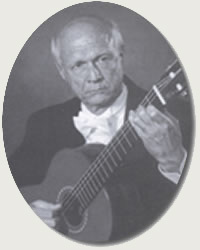 He has recorded three albums and three CDs, to critical acclaim, for Prism Studios and his latest CD, Homage to Villa-Lobos, is the result of a 14 year research project to incorporate the little finger into the right hand technique of the classical guitar. Charles Postlewate is a founding member of the Guitar Foundation of America and has published feature articles in their quarterly journal Soundboard as well as in Guitar International, American String Teacher and Guitar Player Magazine. He is presently Associate Professor at The University of Texas at Arlington. This DVD is a presentation of the 19-year project by Charles Postlewate on extending right hand technique for guitar to include the little finger. Part I presents this technique in actual repertoire, including standard guitar repertoire (by Barrios, Sor, Torroba and Villa-Lobos), new arrangements & transcriptions and original compositions. It features complete performances of twelve pieces recorded on Postlewate's Homage to Villa-Lobos CD. Each performance is introduced by Postlewate with explanations and demonstrations of how and where the little finger is used in the execution of scales, chords, arpeggios, tremolos and harmonics, with close-up shots of the right hand. Part II explains the training of the right hand in a five-finger technique, with demonstrations of the above techniques using sample studies from the different chapters of his book, Right Hand Studies for Five Fingers. As in Part I, close-up shots show the viewer precisely how to position the right hand and move the fingers for each study or set of studies. Each set of studies uses a special progression up and down the fingerboard and, like the book, this video demonstrates how to make chromatic variations of these progressions to increase the interest. At the end of Part II Postlewate demonstrates how the guitarist can develop similar studies to fit specific right-hand problems not covered in this book and DVD. The culmination of a 14 year research project, this book contains over 350 studies to thoroughly train the right hand of classical guitarists in the use of all five fingers - adding the little finger to the present four finger technique. These studies build a five-finger technique in the playing of chords, arpeggios, tremolos and harmonics, beginning with the thumb and one-finger combinations and increasing in complexity to the thumb and four fingers. The studies are played over easy, yet interesting left hand chord progressions up and down the fingerboard. Postlewate demonstrates how to develop your own right hand studies by including examples from standard classical guitar repertoire pieces by Fernando Sor, Federico Moreno Torroba and Heitor Villa-Lobos at the end of the book. This is the first compilation of guitar music specifically composed for right-hand technique that includes the little finger. The 57 compositions include original pieces in the intermediate through advanced levels by renowned guitarist/composers from Europe, North America, South America, and the Caribbean. Music by Ernesto Cordero, Carlos Dorado, Jim Ferguson, David Flynn, Gerald Garcia, John Hall, Ricardo Iznaola, James Lentini, John Oliver, Charles Postlewate, Mirko Schrader, Burkhard 'Buck' Wolters, and Luis Zea show the advantages of a five-finger technique in the playing of scales, chords, arpeggios, tremolos and harmonics. They also show the advantages of using the little finger for speed, accuracy, strength and balance. All of these compositions are edited and fingered by Postlewate, pioneer in the use of a five-finger technique. John Hall Plays "4 Etudes For 5 Fingers"
This is an anthology of beautiful easy-to-moderate level pieces by 19th century masters of the guitar: Dionisio Aguado, Antonio Cano, Federico Cano, Matteo Carcassi, Fernando Sor, and Francisco Terrega, adapted for a modern right-hand technique that includes the little finger. German Professor of Guitar Leonhard Beck has compiled this collection with the assistance of Charles Postlewate, pioneer of the use of the right hand little finger. It shows the advantage of using the little finger in the playing of scales, chords, arpeggios, tremolos and harmonics for speed, accuracy, strength and balance. These studies make good repertoire pieces for the beginning guitarist or for the advanced guitarist who wishes to add the little finger to an already-developed right-hand technique. They are graded in three levels of Easy (7 studies), Easy-Intermediate (9 studies) and Intermediate (11 studies) for the progressive development of the right hand. Includes original compositions by Charles Postlewate -"Homage to Villa-Lobos, Variations on a Theme of Prokofiev, Improvisation on Green Dolphin Street". Piano transcriptions by Claude Debussy "La Puerta delvino, Dr. Gradus ad Parnassum". Two arrangements "Jose Maria" -Alicia Maguina, "Virgenes del Sol" -Jorge Bravo de Rueda. New editions of standard classical guitar repertoire -"Study in A Major: Opus 31, No. 19, Study in E Minor: Opus 6, No. 11" -Fernando Sor, Una Linosna Por Al Amor de Dios" -Agustin Barrios. Excerpts of standard classical guitar repertoire -"Sonatina III. Allegra" -Torroba, "Prelude #2" -Villa-Lobos.